As 2017 gave way to 2018, many in civil society found renewed purpose in striving to make democracy real, and demanding human dignity and justice. Read the State of Civil Society 2018 report here. 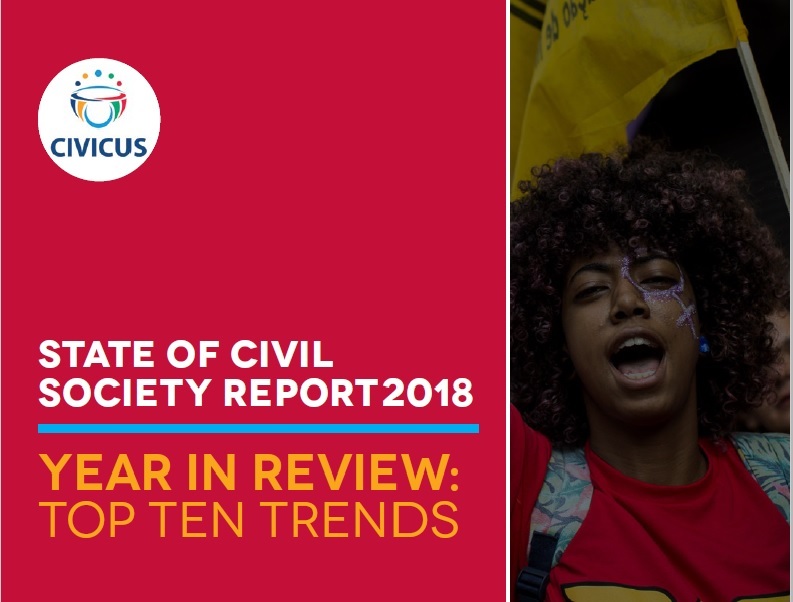 Even as attacks on civil society have become more brazen, the story of the past year was one of resolute resistance against the rising tide of restrictions on fundamental freedoms and democratic values, according to CIVICUS’ 2018 State of Civil Society Report, released 6 March 2018. Sobering data from the CIVICUS Monitor reveals serious systemic problems with civic space in 109 out of 195 countries covered. However, there are also numerous examples of civil society successfully advocating for progressive new laws on women’s rights, access to information and protection of human rights defenders. The report highlights how when the worst of humanity came to the fore as in Myanmar, Syria and Yemen, civil society showed its best by voluntarily placing themselves in the firing line, doing what they could to help and exposing human rights abuses. When devastating earthquakes hit Mexico and hurricanes struck the Caribbean, it was civil society that mobilised as first responders. Thanks to civil society advocacy, serious steps were taken towards the aspiration of a world free of nuclear weapons with the agreement of the Treaty on the Prohibition of Nuclear Weapons. Findings from the report point to 10 key trends impacting on civil society in 2017. There are increasing instances of personal rule by political leaders replacing the rule of law and undermining democratic institutions in many countries. Polarising politics and unjust economic systems propelled by cronyism are dividing societies and reducing the international community’s ability to address key global challenges such as violent conflict, inequality and climate change. Several high-profile journalists reporting on corrupt activities of political and economic leaders or covering public protests were attacked in brazen ways, revealing perpetrators’ confidence of impunity. The promise of the internet and social media is being compromised as illicit surveillance has become more commonplace. Many in civil society are being targeted by false propaganda spread by rogue states and extreme right-wing elements. Importantly and positively, the report highlights that patriarchy and gender inequality are under the spotlight, with growing demands for meaningful long-term change in oppressive practices, including within civil society. The #MeToo and Time’s Up movements, demanding an end to sexual harassment and discrimination, are positive examples of citizens mobilising for change in creative and powerful ways. • Democratic governments should model the deepening of democratic practice by enabling spaces for discussion, dissent and dialogue at all levels and also resist moves to weaken human rights standards at the multilateral level. • Multilateral institutions should reinforce the primacy of civil society participation in decision making and find new ways to open up spaces for public participation in their activities. • Private sector, media and academia should make common cause with civil society in the defence of human rights by forming new alliances, sharing platforms and by developing and partnering in joint campaigns. “The challenges faced by citizens around the globe aren’t so much about reviving our weakening democracies as about re-imagining democracy in a radically changed world,” said Sriskandarajah.